Wednesday’s heavy, wet snow caused widespread tree damage, including broken and fallen limbs. The City of Fort Collins is currently working with community partners including Colorado State University, Larimer County, and others on community clean-up efforts. The city will offer no-cost branch removal and recycling assistance to all residents beginning Monday, Oct. 31; work is scheduled to be complete by the end of November. Both curbside pick-up and a recycling drop-off location will be available. Any residents who need assistance in moving tree branches, or who would like to volunteer to help those residents, can call 2-1-1. The city will grind all collected trees into mulch; broken limbs will not be taken to the landfill. The city is currently exploring partnerships with both public and private business to identify the most efficient method to recycle the branches. Work will begin on the north side of town as that is where tree damage is most severe. Crews will only make one pass per zone to pick up debris. See the attached map detailing zone locations. It is essential that residents have all branches in place before 7 a.m. on the Monday of the week that work in their zone is scheduled to begin. Crews will move throughout each zone during its scheduled week, so residents should be aware that their branches could be picked up on any day within their week. It is imperative to meet the 7 a.m. Monday morning deadline, because crews WILL NOT return to an area within a work zone that has already been cleared. Please note that this schedule is weather permitting. 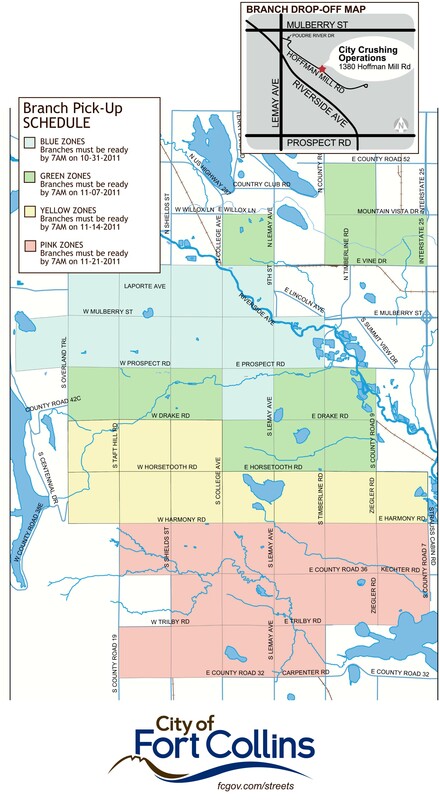 Residents will be notified of any pickup schedule changes via local media, social media, and fcgov.com. In most residential areas, residents can place their branches in the street by the curb. Residents living on arterial streets (heavy traffic) should not place branches in the roadway. These residents should place branches at the back of the sidewalk or, if there is no sidewalk, at the back of the curb. Please ensure that all travel lanes and sidewalks are clear. In both residential areas and arterial streets, crews will not remove debris from yards or driveways. If residents wish to clear storm debris before their scheduled neighborhood cleanup, they can drop off branches at the City’s Crushing Operations Facility located at 1380 Hoffman Mill Rd. (see attached map). The Crushing Operations Facility will be open and staffed from 8 a.m.-5 p.m. Monday-Friday, and 9 a.m.-3 p.m. Saturdays, Oct. 31 until Nov. 23. Please check in at the scale house upon arrival for directions. Residents can also drop off materials at Hageman Earth Cycle recycling center (fee charged) located at 3501 E. Prospect Rd. The City is working with community partners to facilitate clean-up efforts. Poudre School District (PSD) – Working with PSD, the City has made clearing the sidewalks and driveways around schools a priority to assure student safety and accessibility. We are currently investigating other partnership options. Larimer County – Larimer County and the City are working together to keep broken limbs and other debris out of the landfill. United Way – United Way 2-1-1 Larimer County is coordinating efforts to link neighbors in need with willing volunteers. Any residents who need assistance in moving tree branches, or who would like to volunteer to help those residents, can call 2-1-1. CSU SliCE Office – The City is also working with CSU’s SliCE (Student Leadership Involvement and Community Engagement) office to coordinate additional student volunteers to assist with cleanup efforts. Neighbors Helping Neighbors – The City is also encouraging individuals with equipment, tools, or just an extra set of hands to assist neighbors in cleaning up their private property and moving debris into the street. Fort Collins Museum & Discovery Science Center – closed until further notice, due to severe tree damage. The Terror Tours scheduled for Oct. 28-29 will continue as scheduled. It has not yet been determined whether Sunday’s Dark in the Park closing ceremony will continue. Grandview Cemetery – closed; crews will re-evaluate safety conditions tomorrow, Oct. 28. The Farm – closed, but will reopen for the Treatsylvania and Bow Wowvania events this weekend. However, conditions at The Farm are wet and muddy – boots are recommended for all attendees. Poudre and Spring Creek Trails – open and passable, but hazardous conditions still exist in some spots. Please use caution on the trails.